For the first time, six restaurants from Walt Disney World Resort hotels have joined the program’s growing line-up. Enjoy special menus at: Jiko at Disney’s Animal Kingdom Lodge; The Wave at Disney’s Contemporary Resort; Boatwright’s Dining Hall at Disney’s Port Orleans Resort; The Turf Club at Disney’s Saratoga Springs Resort; The Grand Floridian Café at Disney’s Grand Floridian Resort; and Olivia’s Café at Disney’s Old Key West Resort. Other hot new names participating are: Bulla Gastrobar; Chroma Modern Bar + Kitchen; DoveCote Brasserie; Earls kitchen + bar; Luke’s Kitchen; Mango’s Tropical Cafe; Paddlefish (at Disney Springs); 1921 by Norman Van Aken, and Reel Fish Coastal Kitchen + Bar. And that’s just a small portion of the huge list of participating restaurants. This is seriously a great event for foodies! Freedom Ride, Inc., which offers therapeutic horseback riding programs that enrich the lives of children and adults with physical, emotional and learning disabilities. BASE Camp Children’s Foundation, which provides a base of support for children and families who are facing the challenge of living with cancer and other life-threatening hematological illnesses. This year’s restaurants encompass a variety of cuisines and atmospheres, and offer a menu and setting for every occasion. There are also a lot of vegetarian options this year, as well. Reservations are recommended. 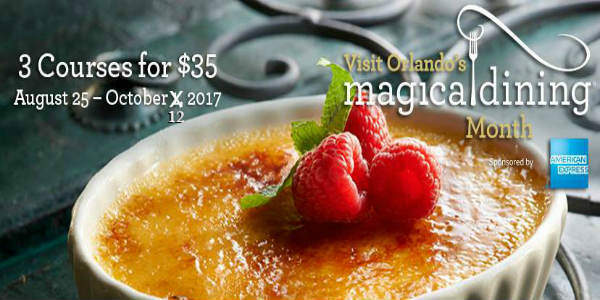 When seated, request the Visit Orlando’s Magical Dining Month menus, and order your choices from it. It’s super easy! No need to clip a coupon or anything. For a full list of all participating restaurants, menus and OpenTable reservations visit OrlandoMagicalDining.com. If you visit any of the restaurants and post to social media, be sure to tag @VisitOrlando, and follow them for more information.